“We are all called to be the sacred CEO of our lives." With parents in love with their careers at Hewlett-Packard, Lindsay Pera grew up immersed in the culture of a company that truly cared about their ethics, employees, and values. Even so, she resisted working in the corporate world due to her love for people and not wanting to work in an office. Her interest in cognitive science led her there anyhow, with a career in management consulting, innovative mobile technology solutions, and ... See More knowledge management. A decade later a health crisis forced Lindsay to retire from her corporate career. As she embraced her intuition, she healed herself and her family, and embarked on a new path as an entrepreneur. Her work and life now bridges the worlds of technology, strategy, and intuition. She helps clients improve livelihood, productivity, and revenue as they learn to embrace practices that bring unity to heart and mind. 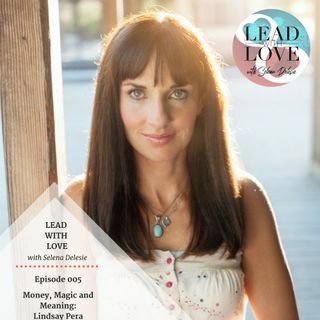 Lindsay shares how to gracefully navigate real challenges at work and home, build innovative and thriving organizations, and live an abundant life of meaning. Connecting with our authentic heart allows us to do anything. When we live from this place, we will inspire and lead others to do the same, and witness beautiful shifts in the world around us. Lindsay Pera began her career as an analyst in Accenture’s technology strategy practice and then transitioned to a $2 billion insurance company to help drive pivotal IT transformation. In 2004 she left Silicon Valley and moved with her family to a beautiful multi-generational homestead on the Central Coast of California. Lindsay wants to live in a world where appreciation flows freely, kids play outdoors and lemons are in season year round. As a Mystic mama, tech entrepreneur and intuitive strategist she's a sought after contributor and motivator on all topics health, wealth and transformation. When she is not extolling the virtues of “Sacred Commerce” or “Resonance” based business, you can find her knocking almonds and generally getting her gratitude on.